I have a special treat for you today. 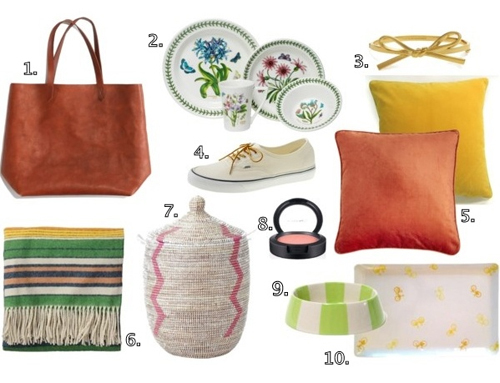 My good friend (& interior designer extraordinaire), Joanna (Jojo to me) of Cline Rose Designs, is here guest posting and sharing her Spring Wish List with you all. She is one of the coolest girls I know (her style is impeccable), and I am always looking up to her for style inspiration. Take it away, Jojo! 1. I'm in love with this leather tote from Madewell. It would be the perfect accessory to lug around the High Point Furniture Market in April. And you can monogram it. You're not not going to monogram something given the chance, right? 2. Lately, I've had so many clients with amazing floral china collections, passed down from mothers, grandmothers and great-grandmothers. I'd love to mix in a few with my own plates. Like these. I know, I know. Florals? For spring? Groundbreaking. 3. Just for fun, I threw in this Bow bangle from Kate spade. I'd settle for this ring, too. 4. I've mentioned these shoes before on my blog but here's the catch. J.Crew doesn't make them in my size since they are technically mens shoes (the smallest size is a Women's 9). So, I've ordered Authentic Vans and similar brown shoelaces from Amazon hoping to copy the look. Fingers crossed. 5. I don't know about you, but I'll be adding a handful of these velvet pillows from World Market to my sofa this spring. An easy (and cheap!) way to change your look for the season. Check out all the colors! Plus, velvet is huge at the moment. 6. My mother-in-law gave me a wintery Pendleton blanket for Christmas and I've been obsessed with it ever since. I'd love to have a springy one just like this to use around the house. For the occasional picnic, of course. 7. No matter what I do, my shoes seems to congregate in multiples by the front door. So, I'd love to have a pretty storage basket, like this one from Serena and Lily to hold all my random pairs of flips and shoes. 8. I'm not a big make up person but I can always count on mascara, bronzer and lip gloss. I'd love to add this Mac blush in Melba to my repertoire. It's the perfect mix of blush and bronzer. 9. If I'm getting new springtime plates and bowls, Gus, my dog, should get some too. 10. I love trays. And I really love the bicycle print on this tray. The fact that it's named "Joanna" certainly doesn't hurt.